Denied Entry with ESTA, will it affect a future K1 application? Hi, i'm hoping someone might have some advice or information about my recent experience. My fiance and I have been together for 3 years now and he is from the US and i am from the UK. We booked a holiday for me to visit him in the US this past week and I was denied entry at the first US airport i landed at (Minneapolis). I had a pre-approved ESTA visa waiver program and was due to come home on the 89th day. However once i landed, customs did not like that i didn't have as much funds on me as they wanted, and they did not feel i had enough 'ties to home' due to i do not currently have a job. Even though i had return tickets, travel insurance, and they looked through my luggage and phone where i had numerous conversations with people talking about my return that showed my intention to leave. Safe to say, it was awful. I was denied entry to the US and told i could not enter again using ESTA, that i would have to get a tourist visa from the embassy and put straight back on a plane home. Completely traumatizing and emotionally devastating. Because I still do not have different circumstances, i believe a tourist visa would be denied for the same reasons if i applied any time soon. We started researching the K1 last year and were trying not to rush it by taking our time. At this point we feel that is going to be our focus and we want to push forward with it. So my question is, will my denial to enter the US make any difference to a K1 application? Also will my circumstances ie. no job cause any issues for us during the process? How much time were you spending in the US? They don't typically scrutinize VWP travelers, especially looking through their luggage and phone, unless they already suspected something. The return ticket is a requirement of using an ESTA anyway. Your denied entry won't impact a K-1 assuming you were only denied entry (not an expedited deportation). Your current employment status isn't an issue so long as she is a suitable financial sponsor or she finds a suitable co sponsor. I had a pre-approved ESTA visa waiver program and was due to come home on the 89th day. Sorry to hear about your experience...It sounds to me that maybe they were suspicious that you ever had intentions to return back, especially with fiance in the US, possibly suspicious of your return ticket purchased so conveniently for the 89th day...it might sound odd but that might've seemed suspicious to them, especially if you didn't have said funding to back it up. Having a fiance or heck even sometimes just a boyfriend/girlfriend who lives in the US can significantly up the scrutiny. I wouldn't take this too personally, sounds like they were just following protocol of assuming you had some form of immigrant intent via the fiance. Your fiance is a "tie" to the US, probably because of this, they assumed you had stronger reasons to stay in the US rather than return back home. It does seem that they red flagged me as soon as i said i was coming for 89 days and to see my boyfriend while i was visiting as a tourist. But i was just being honest so i didn't realise. I can somewhat understand why my circumstances caused suspicion, but it's just so frustrating when i know, and everyone else that knows me, knows my intentions were completely not to do anything wrong. I suppose i was naive in the ESTA allowing you to stay for upto 90 days, i was trying to make the most of my trip by staying as long as was allowed. But the whole process was horrible, it was all so fast, i did not get time or opportunity to go into depth for my answers and to try and convince them with my proof. I also got no explanation after being told i was being refused entry other than very briefly being told a sentence about 'ties' even though i kept asking and saying i didn't understand. I don't even know what kind of removal i got, as i was put on a plane right after they gave me the decision and paperwork. However, they did tell me, and it's written on my paperwork, that i can not enter the US on an ESTA ever again, but that i must obtain a visa to enter the US in the future. Nothing is written about being banned or anything. So i don't know what it means? Does it seem like a regular denial? I am so upset by everything and now scared to start the process of the K1 incase. Just incredibly devastating, a stark reminder of how painful and difficult long distance is even when you are trying to do everything legally! There should be a denial code referenced on your paperwork somewhere ndicating the part of the statute you were denied entry under. I doubt you were formally removed when they could just as easily simply denied you entry on the VWP, but it's something you should check. Assuming you were simply denied entry then it won't affect any K-1 that you apply for. "You have been found inadmissible to the United States today. You are being refused admission to the United States under section 217 of the Immigration and Nationality Act. You may never again use the visa waiver program. You must obtain a United States visa to enter the United States in the future". The same was stamped in the back of my passport about refused under section 217, with some handwritten numbers along with it. So even though they put me right back on a plane, this was a simply denial of entry? Post the handwritten numbers. That's likely the exact reason you were denied entry. If I had to guess I would say it will be 212(a)(7)(A)(i)(I). Like other said, it won't effect your K1 as long as it wasn't deportation. Were you here a short time ago on ESTA too? If so, they might suspect misuse of ESTA. It's a little foggy since you can stay 90 days at a time, but some people stay 90 days, cross the border to Mexico or Canada to 'reset' and then try to come back for another 90 days. Not saying you did that at all, but if you were here a short time ago and now came back for almost the full 90 days, they might've suspected misuse. some people stay 90 days, cross the border to Mexico or Canada to 'reset' and then try to come back for another 90 days. As we have seen, it is perfectly possible to travel to Canada or Mexico when travelling to the USA under the Visa Waiver Programme. However, it is important to remember that you are still adhering to the conditions of the Visa Waiver Programme when you do this. This means that you cannot travel to either of these countries in order to ‘reset the ESTA clock’, as we discussed. That's strictly prohibited, so no one who crosses into Mexico or Canada can 'reset.' It's impossible. Look at this from another point of view. The officer did not have "it out for you from the start." The officer was doing his job. Many people uses the VWP to bypass waiting for the K-1 as many of them AOS after marrying while here on the VWP. The simply do not use their return tickets. Something that you could have easily done if you had been allowed entry into the US - marry, file for AOS, and not use your return ticket. Under US law, the burden is on you to overcome the legal presumption that you intend to immigrate. By having no job and insufficient ties to the UK, you did not meet this burden. Just because you don't like the results, it doesn't me someone had it out for you. That person was doing his/her job. The legal burden is on you, not them. Water under the bridge since your likely allowed to leave by withdrawing your attempt to enter the US, and that will have no bearing on the K-1. I realise they have a job to do and how they need to do it. And people do break the law and stay illegally so it ruins it for the rest of us. Just very upset by the whole ordeal. I do feel I was not given much of a chance to convince them though by how rushed they did it and didn't let me elaborate on short answers or explain anything to me. But what is done is done I guess. I wasn't told anything about withdrawing my attempt to enter though, so does that mean I wasn't offered it? From googling this, it sounds like that is discretionary by the officer? And as I said they just took me straight on a plane home, so I don't know. 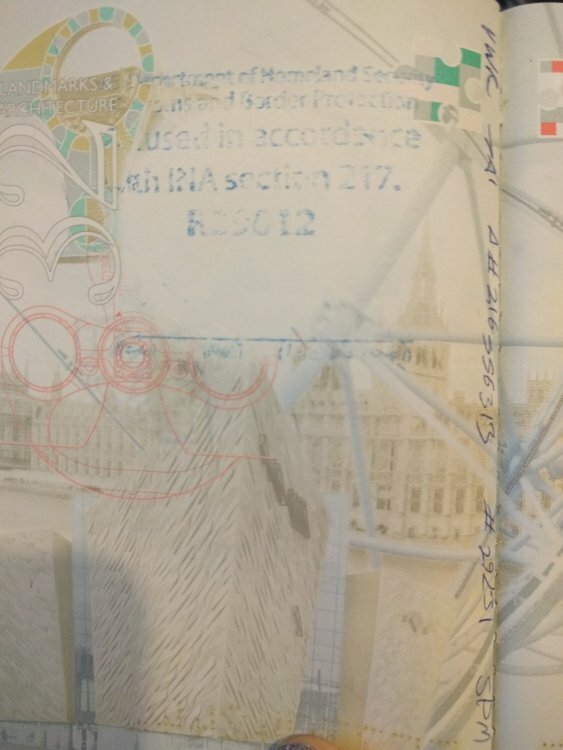 They did tell me that I can always go for a visa from the embassy instead, and nothing about being banned, so I'm hoping that means no affect towards a K1? But I don't know for sure and don't know how I'd find it for sure. I'm just very overwhelmed and confused. And yes, this was my very first trip anywhere. Ahh so he had been the one travelling and had met you in the UK and this was your first tip to see him.